Orphaned in a civil war, Chipo and his sister Gentle survive by sorting through rubbish looking for metal, plastic, wood and electrical wire. Gentle has a cleft palate and lip and is thus vulnerable to bullying and harassment so she hides her face with a cloth. She dreams of finding ‘Happy Split-Face Land’ where her face can be magically mended – it must be possible because there are before and after pictures of children with split faces in a scrap of newspaper she once found. Desperate to improve their lot, Chipo tries to keep a discarded television to sell rather than handing it over to Papa Fudu who owns the rubbish dump. The plan ends disastrously with the children having to run away from the only home they have – but they do acquire a stray dog, Mouse, on the way. Mouse proves a great friend and protector and after many adventures the children are lucky enough to meet street dwellers Miss Pink and Mr Calabash who take them under their wing. 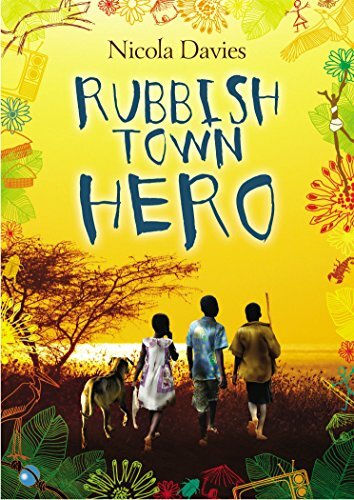 Children work sorting rubbish in dumps in many different countries; we are not told where Chipo and Gentle live although it is somewhere in Africa, perhaps Nigeria.Via the children’s adventures and the people they encounter, the reader learns much about their bravery and resilience in the face of overwhelming odds. Nicolas Davies conveys all this with a light hand – her tone is not preachy or didactic and her characters are engagingly real. The alternative family they eventually create is a solution resorted to by many street children. The story ends with hopes of a better future for Chipo, Gentle and their friend Dede. Young readers in the affluent West will no doubt be amazed that there are children of their own age who have to fight to survive in such conditions.